The use of red clover in the U.S., as measured by seed production, is only about 10 percent of what it was at its peak around 1950. But since 1990, red clover seed production has stabilized at about 10 million pounds of seed produced each year (see figure) compared to 57 million pounds for alfalfa. There is a dedicated niche market for red clover but a limited amount of research to improve red clover options. Recent research has improved the persistence of red clover, and current research is trying to develop varieties that are tolerant of commonly used broadleaf herbicides. Red clover has a long history of use in agriculture and is associated with agricultural intensification starting in the 1500s. Initially, it was used in cropping rotations as a nitrogen fertilizer source. However, starting in the 1950s, there was a large drop in red clover usage until about 1990. This decline in red clover usage is mirrored by an increase in synthetic fertilizer usage. It is interesting to note that during a recent spike in nitrogen fertilizer prices, there was a spike in red clover seed production, indicating that, to some extent, producers will revert to red clover usage to achieve nitrogen fertilization. FF 9615 red clover (outlined in yellow) as seen in the third year of a variety trial, showing superior persistence compared to the other varieties. The USDA National Agricultural Statistics Service (NASS) does not keep records on red clover acreage, but it does keep records for seed production. It is estimated that 80 to 90 percent of red clover seed is produced in Oregon. Assuming that most of the seed produced in the U.S. enters U.S. markets, there would be an estimated 3 to 6 million acres of land planted with red clover (compared to 18.2 million acres for alfalfa). Much of this acreage is likely in mixed grass/legume pasture. As in the past, current producers still look to red clover to supply nitrogen fertility to their systems and to enhance feed quality. The estimated value of red clover is shown in the table. 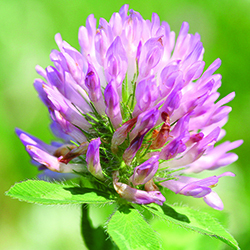 Today, red clover is used in very diverse management systems including: as a summer or winter annual cover crop or hay/silage crop; as a companion with a small grain crop; in a pure stand for hay or silage; in a pasture mixture; or overseeded into existing pasture to improve pasture quality. Red clover has excellent establishment ability and is very shade tolerant, allowing it to be used in a range of management systems. Red clover’s major weakness is its shorter life span, although newer, improved red clover varieties can persist for three to four years. Due to a scarcity of breeders and resources, breeding targets remain to improve plant persistence and enhance forage yields in diverse management systems. From a management perspective, one reason for red clover’s shorter stand life could be insufficient seeding rates. Currently, there is little consensus in recommended red clover seeding rates. An internet search revealed a range of 8 to 20 pounds per acre for pure-stand establishment, and a range of 3 to 14 pounds per acre for overseeding existing pastures or establishing red clover as part of a mixture. Such hugely variable seeding rates likely have a major impact on red clover stand life. Clearly, more research needs to be done to clarify red clover seeding rates, particularly when considering the use of new and improved red clover varieties. There are about five organizations actively engaged in red clover breeding in the U.S. and Canada, including the U.S. Dairy Forage Research Center. These breeders are striving to improve red clover for use in very diverse environments from subtropical Florida to cool temperate climates in Canada. One new variety developed at the U.S. Dairy Forage Research Center is FF 9615; it became commercially available through forage seed vendors in 2015. This variety has significantly improved persistence and yield and is expected to improve red clover productivity in the cool-humid regions of the U.S.
Producers using red clover in pasture mixtures with grass have limited herbicide weed management options if they want to retain forage legumes in their stands. Producers would benefit by having red clover varieties that are tolerant of commonly used broadleaf herbicides such as 2,4-D. Work to develop such red clover material was initiated in the 1980s at the University of Florida using a traditional breeding approach. Recently, researchers at the University of Florida and the U.S. Dairy Forage Research Center have revisited this material to develop it further to create varieties for use by producers. The University of Florida released a variety called FL24D that is not yet commercially available. The U.S. Dairy Forage Research Center has transferred the Floridian 2,4-D tolerance into red clover germplasm that is better adapted to the northern U.S., and they have also selected for increased 2,4-D resistance. In field tests, this red clover tolerated standard 2,4-D application with no plant death and some initial plant injury followed by plant recovery. Currently, experimental varieties from this material are being developed and tested with a focus on improved agronomic performance in northern U.S. growing conditions. This article appeared in the March 2016 issue of Hay & Forage Grower on pages 18 and 19.